Hello wonderful humans of the internet and happy FriYAY! Is it too early to kick back and relax with a glass of wine and Netflix? No? Okay then, I guess I will just share 5 things I have been into lately instead. Over the past week I have acquired some new products I am excited to try out! I have added to my Glossier addiction, and I think it’s safe to say its becoming problem. Hello, my name is Alison and I have a Glossier problem. I order their Stretch Concealer in Medium, Generation G Matte Lipstick in the shade Cake, and yet another Balm Dotcom in the flavor Coconut. I think I am going to do a post very soon reviewing all of the Glossier products that I have acquired over the past month or so. Another new product that I just got and started using is the Kristen Ess’s The One Signature Shampoo & Conditioner that just launched exclusively at Target. Both are 10oz. bottles for $10 each, so not too bad if you are used to spending a little more for your haircare products. This was the only shampoo and conditioner pair that was part of this new line and from what the bottle reads this is for all hair types. This is supposed to be lightly clarifying but safe for everyday use and weightlessly moisturizing which is good if you have finer hair. I like that this is sulfate-free but claims to give a good lather if that is important to you. The jury is out on the scent, although it has a very high-end salon smell once your hair is dry, I don’t know how I feel about it when I am washing it. Over the past weekend My mom and I went to see the movie Split starring James McAvoy (according to my mom, that’s her man). What can I say about this movie other wow… just WOW! It was such a well done psychological thriller, as in sitting on the edge of my sit covering my mouth with my hands because I cannot believe the amazing plot unfolding before me, psychological thriller. McAvoy plays a man who suffers from DID (dissociative identity disorder) and has 23 different personalities residing inside him. He kidnaps 3 girls in preparation for a 24th personality to surface. I highly recommend seeing this movie and basically hooks you right in from the start. I believe it was the day before Christmas Eve (or Christmas Eve Eve, if you are a Friends fan) I got my 2 little packages with my brand new glasses from EyeBuyDirect and something tells me there will be more little packages from them in the future. If you read last week’s post where I talk about how I discovered my Lo & Sons bag, I also discovered personally EyeBuyDirect on my Pinterest feed as well. Again I did what I always do, stalk a company through Instagram, see what what people tagged them in and how their glasses were looking IRL. First of all I am a big believer in not paying an arm and a leg for glasses so when these eyeglass companies began popping up I was all for trying them out. I did the home try on with Warby Parker and everything I picked I wasn’t very crazy about once I got to try them on. Then I tried Zenni and I actually have 3 eyeglasses and 1 prescription sunglasses that I really like. But there was something about EyeBuyDirect that really interested me to try them, they have a very minimalistic feel to their brand/styles which I liked and made me want to try. I decided to try the brand out during the holidays when they had a 2 for 1 deal, and after days of narrowing it down I decided on two pairs. I got the Aurora in Flecked Ivory as a more everyday style and then Theory in Translucent as my more stylist pair. 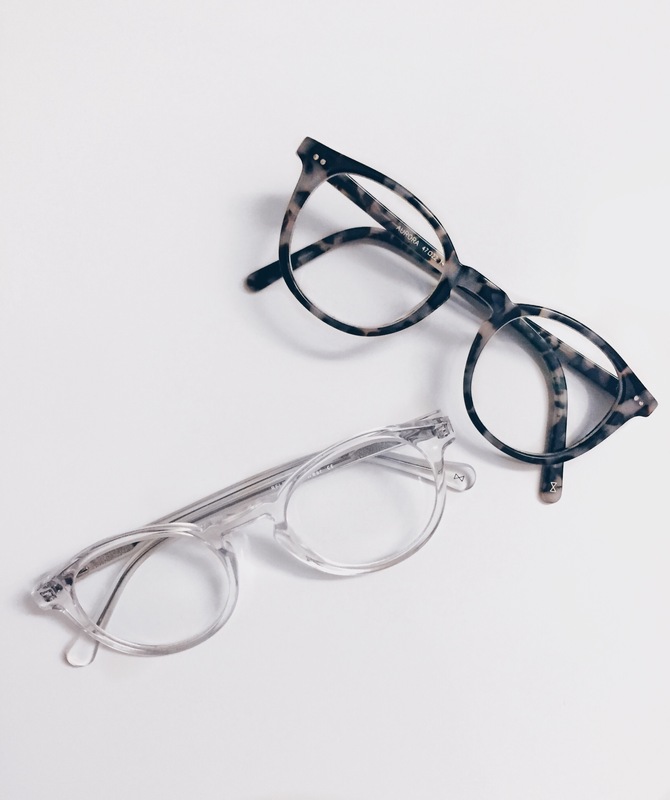 Both glasses are a classic keyhole style which I feel fits my face shape and personal style well. If you want to give it a try and get $10 off your first pair use my code IFSNJ2VM5M. Last week I bit the bullet I have been thinking about for awhile, buying an Amazon Fire Tablet. Amazon offers 5 versions of their tablet that caters to different lifestyles and end uses. I ended up choosing their cheapest model, Fire Tablet 7″ Display, 8 GB (Includes Special Offers), in Black since I don’t plan on using it for anything too crazy. I liked the idea of the smaller size that if I wanted to I would have the option of fitting it into my purse and I also thought this size would be very travel friendly. I am getting ready to go on a business trip to Germany and this way I can download books, movies, and shows to entertain me on the long flight. Overall my first impressions were very good, although it took some getting used to if you are an “Apple product snob” like I used to be (I am slowly crossing over into the Amazon product world). I was able to download easily every app that I wanted to, and I like that my Audible and Kindle books already were on there. I would recommend trying this tablet if you are mostly looking for a tablet as a source of entertainment because for the price I think its a nifty little thing. So I don’t know if you’ve jumped on the podcast bandwagon but if not what are you waiting for? I have a list of podcasts that I listen to while getting ready in the morning or sometimes on my commute to and from work. But I am not here today to give you a list of my favorite podcasts (at least not yet), I am here to talk about one in particular, You Must Remember This (YMRT). The best way to describe this podcast is straight from the source, it is about the secret and/or forgotten history of Hollywood’s first century. Karina Longworth does a fantastic job of researching and narrating different parts of history that took place in Hollywood, by splitting historical stories up into mini series. The one series in particular they got my hook these past few week was titled “Charles Manson’s Hollywood”. If you are not familiar with the infamous cult leader turned murderer of the 60’s I highly recommend you give this a listen as it completely dissects all of the events and people involved with Manson leading up to the Manson Family murders. Bravo Karina, bravo!